Taking care of ourselves as moms including our fitness can feel like the hardest job in the world. 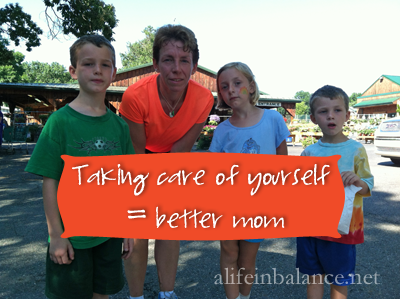 When I had 4 babies and little ones, I struggled to take care of myself. Getting a shower, wearing something other than sweat pants, going to the bathroom by myself were all a big deal. Having the bed to myself with a full night’s sleep was a big deal. Never mind having the time to run. My exercise was walking with a stroller full of kids, and for periods of time, wearing a baby, too. My kids are now 5 and up. Over 18 months ago, I started running again. I ran in the morning before everyone got up and loved it. I ran races. Then, I badly sprained an ankle this past January, and hurt the other ankle in May. Getting to rehab during the summer and doing my physical therapy exercises at home worked. The kids were home. My oldest son was home to pitch in as a babysitter. I didn’t have to get up at the crack of dawn to run. Taking care of my self was easy; I didn’t feel selfish. I knew I had to rehab my injuries even if I didn’t run again. Once you’ve sprained your ankle, you’re more likely to sprain that ankle again. I started running again in August though I found myself getting up later to run. I’d lost the habit of heading out the door at 5:15 am. With school starting in September, I chose to run on 2 week days after dropping off the kids and run on the weekend twice. It worked. I did struggle with getting my physical therapy exercises done at night because now we had Cub Scouts, Girl Scouts, and Venturing on the calendar. This week threw a wrench into my running schedule. My youngest son has been melting down big time in preschool. I’ve been to school twice to pick him up. The principal and I decided to switch my son to half day preschool until Christmas. I won’t be able to do my runs after dropping off the kids because that’s become precious writing time. I feel guilty bringing my youngest son to a local park to play while I run around the track. I feel guilty for feeling frustrated with the change in my schedule. While I can feel guilty initially, I need to work through it and get comfortable with the new schedule. Running is important to me. My son is important to me. It’s okay to spend 30 minutes twice a week running while he plays. It’s okay to take care of myself. I’m learning again to put my oxygen mask on first in order to take better care of my kids. Thank you! My friend that did the thankful days with me passed away this summer. I’m putting it on the calendar as a way to remember her. Don’t feel guilty. Your son is with you and you are doing what is best for him. I bet he loves having that time to play. I’m sure he will! His new nursery school has lots of playtime built into the shorter program. Good for you Barb – I need to find that balance as well. Befor kids I was in the gym 6 days a week 3 hours a day pumping iron in the pit with the “boys”. i loved it – but them life got in the way and I just can’t justify it. I do walk and love it, but I need to find a little more time for me (and try to not miss them so much lol). Colleen (Souffle Bombay) recently posted..Share It Sunday! Good for you Barb – I need to find that balance as well. Before kids I was in the gym 6 days a week 3 hours a day pumping iron in the pit with the “boys”. i loved it – but then life got in the way and I just can’t justify it. I do walk and love it, but I need to find a little more time for me (and try to not miss them so much lol). So true!! And so hard to do….yo uinspire me to keep trying! My husband and I are meeting at the gym tonight, we’ve been slacking lately and both realized we’d be better parents if we got back to a workout routine! Barb, I couldn’t agree more…it is so very important to take care of ourselves. I know that I am a much happier and relaxed person after I have gotten my run in for the day! I ran yesterday for the first time in a while. I felt good to get out and do it with my little one in the stroller. She cheered me on and asked if we could do it to school today. Guess who’s putting on her sneaks again today. I love that you’ve mad running a priority, and your kids seeing you make it one will set a great example to them! Bravo! Thanks for sharing at HDYDI. Great article . engaging. we all need to take care of our self good advice. Thank you! As a mom of 5, it’s way too easy for me not to take care of myself. I am not a runner but completely agree that part of being a good mom is being more than just a mom. Having a hobby of my own or taking time to exercise other than running up and down the stairs to do laundry puts me in a better mood which is reflected in my kids. I so agree with this. I’ve never really had a problem putting my needs first, lol. I guess I’m just selfish. But I am so glad to see more women promoting self care. It is SO important to maintaining good mental health and a happy home.